It has been a while since I have done a post on wine, but a nerve wracking evening watching a cracking game of rugby between England and Wales to kick off the Six Nations (I am an Englishman who has lived in Wales for 25 plus years so have seen the good, the bad and – 2013 – the downright ugly English rugby wise) gave me a good reason to address this. I find watching England play Wales at rugby union (my first and continuing love sports wise – can’t be doing with football) a torrid, nerve shredding and often heart stopping experience. I chew my nails to the bone in my angst as the game ebbs and flows. The need to calm my nerves (and in this case to celebrate a totally unexpected win) gave me an excuse (not that I needed one) for a drop of the hard stuff (wine not spirits – me and spirits do not agree with each other having had a number of violent argument in my youth all of which I lost very badly). A perfect wine to calm the nerves, while watching rugby, or to celebrate a win/drown the sorrows post the game is something made from the syrah/shiraz grape. Wines made from this grape (they are the same) are often characterised by a lovely spiciness, much like most England – Wales rugby encounters. So if they’re the same grape, what I hear you ask is the difference between Syrah and Shiraz? Well, traditionally syrah’s home is the Northern Rhone Valley in France, where it has been used to make wines since Roman times. Such wines include the very lovely, but usually pricey, Hermitage and Cote Rotie (to me, bar from J L Chave”s top stuff perhaps, even the more pricey examples for the most part still offer better value than can generally be found at comparable levels in Bordeaux and Burgundy) to the somewhat more reasonable but generally still good Saint Joseph and Crozes Hermitage. Big and bold wines, but with a bit of guile – the openside flanker/seven of the wine world. Shiraz, on the other hand, is the name the Australians have given to the same grape grown in Australia. I assume partly to allow for a different marketing spiel. It is grown all over Oz, but its spiritual home is the Barossa Valley. So successful have the Aussies been on the marketing front here that, whilst in theory it is syrah other than if grown in Australia, a lot of new world wine producers outside of Oz label their wines (made using this grape) as shiraz (many in South America and South America for instance) rather than syrah. The French/old world syrah wines tend to be slightly leaner (less fruit driven but with perhaps more complexity and subtlety in terms of aroma and taste) whereas the new world shiraz wines are often bigger, but less subtle (a hulking number eight, if continuing with the rugby analogies) with riper, sweeter fruit flavours. This I have to say is a bit of a generalisation. Price wise both can be hideously expensive, with the likes of J.L. Chave’s Ermitage (in France) and Penfolds Grange (in Oz) selling for eyewateringly high prices – certainly well beyond my meagre budget these days. Shiraz usually (but again a bit of a generalisation) starts at a lower price point than syrah. 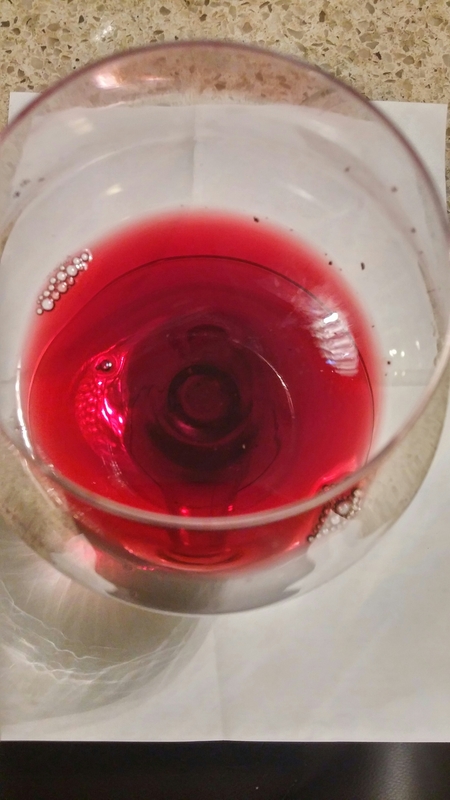 Particularly with Rhone Valley syrah wines, it is often a case of you pays your money and takes your choice, with slim pickings quality wise under £15 – £20 let alone the £10 mark. My usual go to Rhone syrah is a lovely little number from top producer Paul Jaboulet Aine in the form of his excellent Crozes Hermitage Domaine de thalabert which rarely disappoints. It is, however, a somewhat steep £20+ a bottle. I am also very partial to anything from Alain Graillot. His Crozes are always top notch, but again usually over £20. He does, however, makes an excellent Moroccan syrah (Tandem Syrah du Maroc) which is great value at around the £13 – £14 mark and well worth a go at that price. 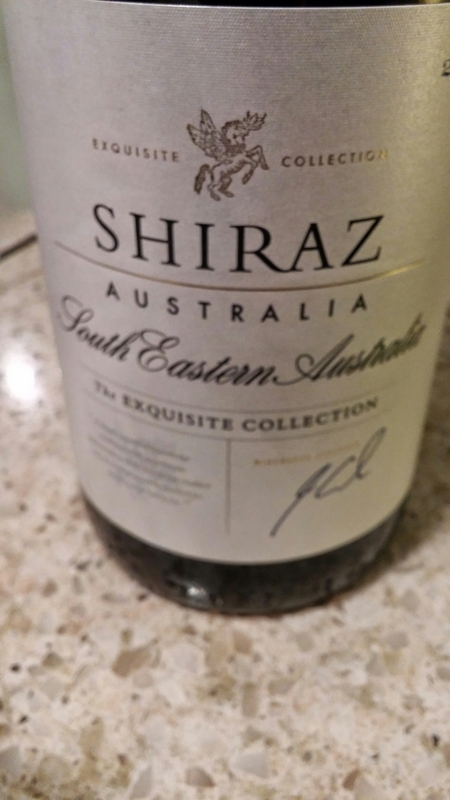 For this post, I set my sights very much at the lower end of the budget scale, buying bottles of both syrah and shiraz wines from the usually fairly reliable and reassuringly cheap “The Exquisite Collection” range from Aldi. In term of Aldi’s “The Exquisite Selection” Crozes Hermitage, this is priced very appealing at well below a tenner. Half the price I would usually expect to pay for a decent Crozes. So is it any good? Well first off it is a 2012 vintage which, whilst a pretty poor vintage in much of France, was not a bad year for the Northern Rhone (vintage tables suggest 7-9 out of 10. but with wines a little young to be drinking now). Colour wise, it is perhaps a tad lighter than I would expect. Syrah is usually on the darker side. On the nose initially it was quite restrained with only hints of dark fruit. This became a more pronounced blueberry after giving the glass a good swirl. On the palate it felt a bit young/ undercooked with slightly unripe dark fruit flavours. Leaving it in the glass for a while mellowed it out considerably and the flavour turned to a more satisfying blackberry (although still lacking sweetness) There was a pleasing pepperiness to it and some warning spice which came to the fore towards the end . There is also a slight vegatel quality to it. Tricky to pin this down, but I would say a hint of maybe olive. The label indicates black fruits, pepper spice and smokey notes. Didn’t get any smoke but two out of three isn’t bad. It would definitely benefit from being drunk with food (say a hearty oxtail stew) and some aeration (possibly even decanting it) to allow it to open up a bit first. All in all perhaps not the most complex syrah, but very pleasant and pretty darn good for the price. I liked it, as did Mrs SF. 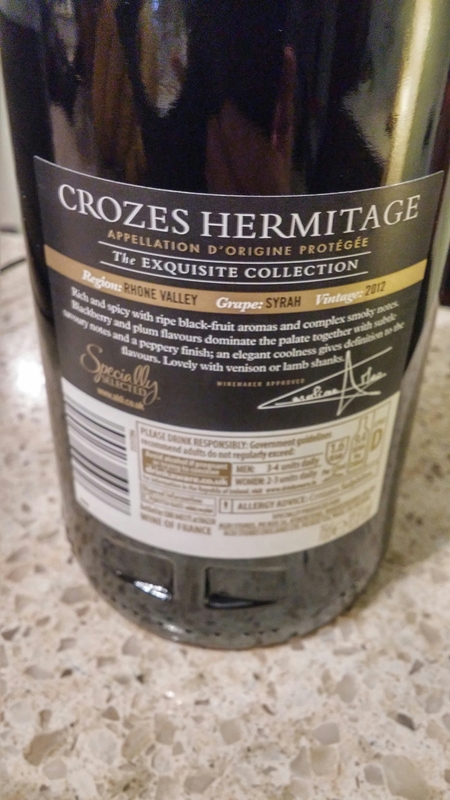 I have certainly had much worse Crozes Hermitage wines that cost a lot more that this one. A definite recommend. 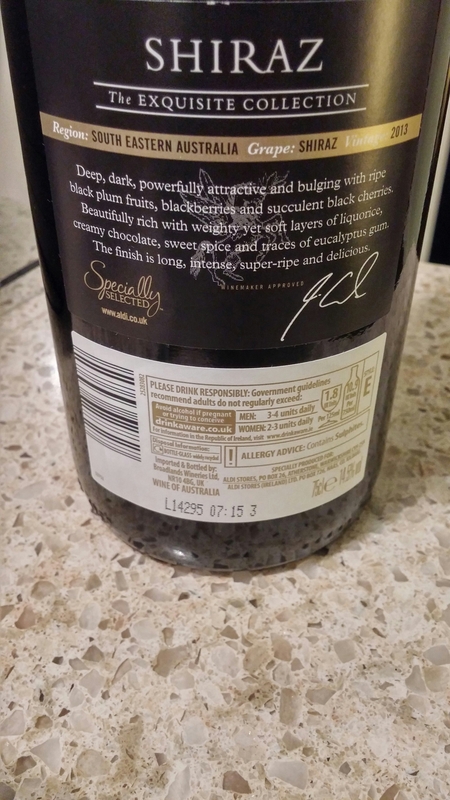 At 14.5°, as against the Crozes’ 12.5°, this is certainly a big hitter on the alcohol front. 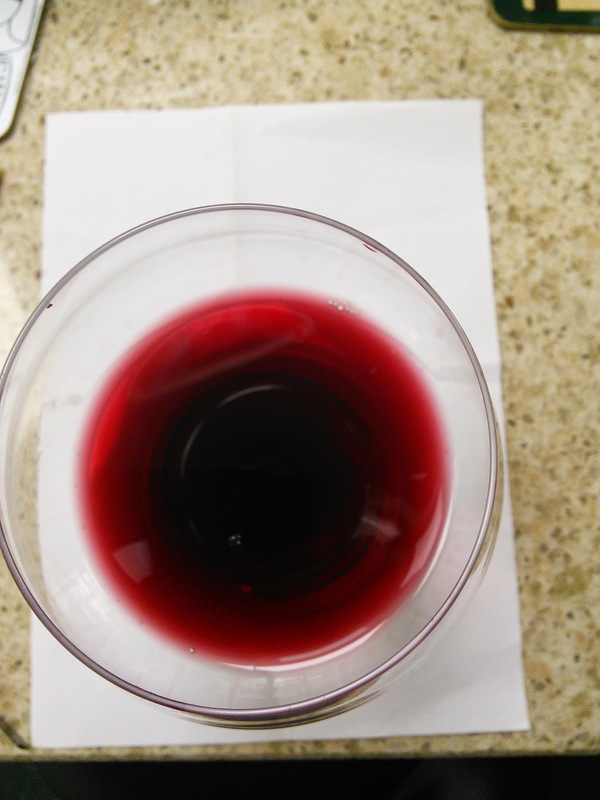 It is much darker than the syrah, being almost opaque purple in colour. On the nose it was all rich dark fruits – almost raisiny with a touch of Christmas cake about it. Due to the rich sweet aromas, I was worried it might be a bit overcooked and jammy (not uncommon in cheaper Shiraz wines). It was, however, surprisingly smooth on the palate with nice sweet bramble fruits ( blackberries) coming to the fore. It had a good length (how long the taste persists ) to it, with a slightly minty aftertaste. Not as subtle as the syrah, but it provided instant gratification and as a result was a highly gluggable wine. Mrs SF marginally preferred it to the syrah. Great value at £5.99, it would go really well with a nice juicy chargrilled sirloin steak. I liked and would recommend both of these wine. The syrah could perhaps benefit from a bit more bottle time (felt a tad young), but is already showing reasonably well. It felt a bit fresher than the Shiraz. Excellent value for the modest £8.99 price tag. Not unexpectedly the Shiraz was richer and sweeter than the syrah. I liked it, especially at the £5.99 price tag. 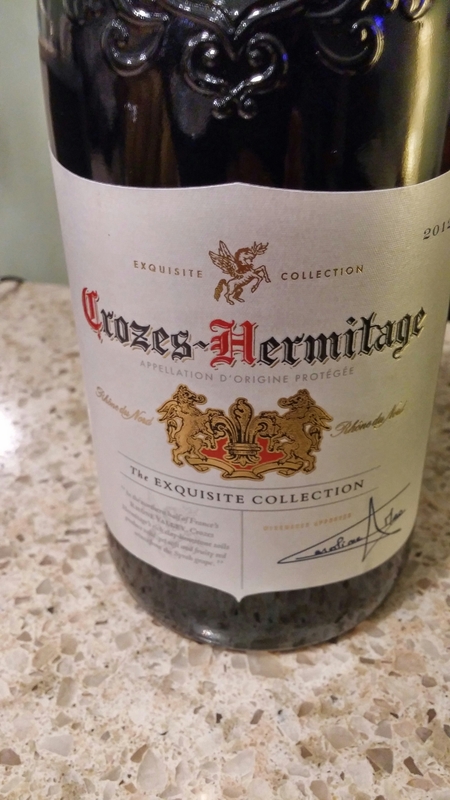 I can see many preferring this to the syrah, but to me it lacked some of the nuances of flavour and aroma I got from the Crozes Hermitage syrah. Would I buy again? Definitely – two excellent value wines from Aldi’s ever reliable “The Exquisite Collection” range. Have to say both where made to taste all the sweeter by England’s unexpected (certainly to me) victory. 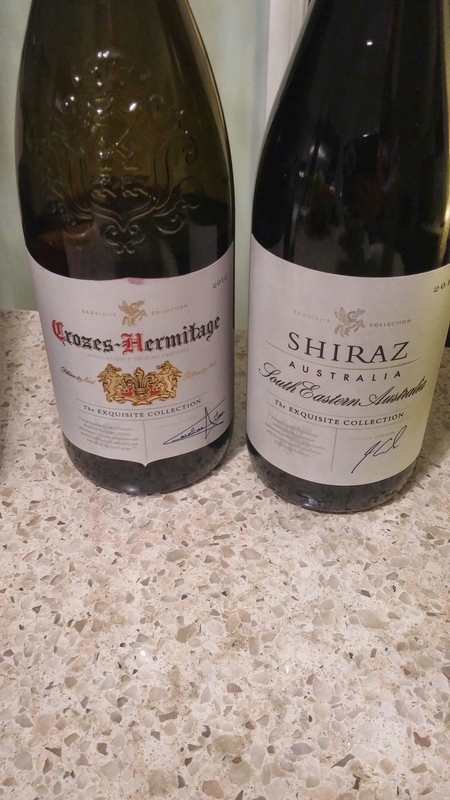 This entry was posted on Feb 8, 2015 by solicitingflavours in Australia, crozes hermitage, Drink, Food and wine products, France, French wine, Red Wine, retail, Shiraz, syrah.